San Marco Coffee is committed to protecting your privacy at all times, in all situations. The information we collect about you when you create an account or place and order on SanMarcoCoffee.com is used to process and fulfill your orders and to provide a more personalized experience on our site. 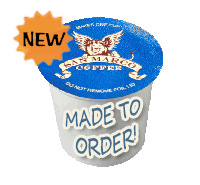 SanMarcoCoffee.com uses a GeoTrust secure encrypted TLS connection to increase the security of your information. When you place an order or create an account on our site, we ask you to fill out a form that requests your name, address, email and phone. We as well sometimes ask for some demographic information such as gender and date of birth. Your name and address information is used solely to process and fulfill your orders. We will NEVER sell, give, rent or trade this information to others for purposes other than order fulfillment. From time to time we may send out email messages alerting you that products are available, to remind you about providing feedback or for promotional offers. In addition, you will receive communication from us 1) if you contact us for a particular reason, 2) order fulfillment, or 3) we need to contact you for administrative purposes. Though we make every effort to preserve user privacy, we may need to disclose personal information when required by law wherein we have a good-faith belief that such action is necessary to comply with a current judicial proceeding, a court order or legal process served on this website. We may correct or supplement your address information with standardized postal representation in order to ensure that your orders are delivered. We do this since we want to make sure that our customers receive their orders and to lower costs associated with shipping carriers. Cookies are pieces of information stored on your computer's hard drive through your Web browser to enable our systems to recognize your browser and to provide features such as storage of items in your Shopping Cart between visits. Please note that cookies from SanMarcoCoffee.com allow you to take advantage of some of our essential features, we recommend that you leave them turned on. For instance, if you block or otherwise reject our cookies, you may not be able to complete a purchase in our store. The Google Analytics features implemented is based on Display Advertising (e.g., Remarketing, Google Display Network Impression Reporting, the DoubleClick Campaign Manager integration, or Google Analytics Demographics and Interest Reporting). Using the Ads Settings, you can opt-out of Google Analytics for Display Advertising and customize Google Display Network ads. You may also download and install the following Opt-out Browser Add-on by Google Analytics .